A daily additive which binds myco-toxins present in feed for grazing animals. It is NOT a cure. 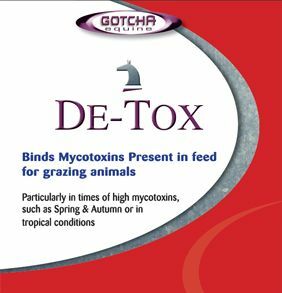 Gotcha Equine De-Tox is a helpful, natural feed additive made from yeast cell wall extract to help absorb toxins in feed. It combines well with vitamin E which is a major antioxidant, interacting with selenium in muscle function and with vitamin A in reproduction. In spring some people report better results by feeding morning and night. What are myco-toxins? Myco-toxins are produced by moulds and fungi. There are hundreds of different myco-toxins which can be present at various times of the year.